1. An anchor or base case, in which the value of the function is specified for one or more values of the parameter(s). 2. 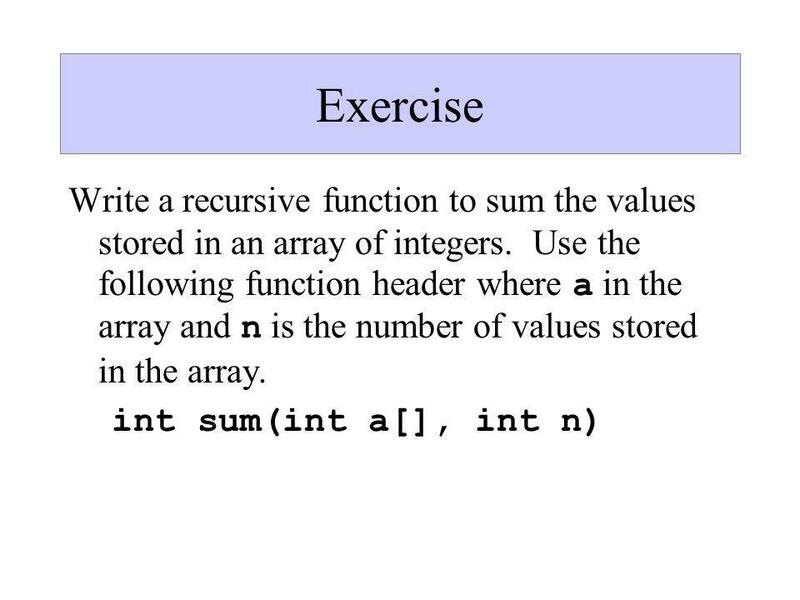 An inductive, or recursive step, in which the function's value for the current value of the parameter(s) is defined in terms of previously defined function values and/or parameter values. 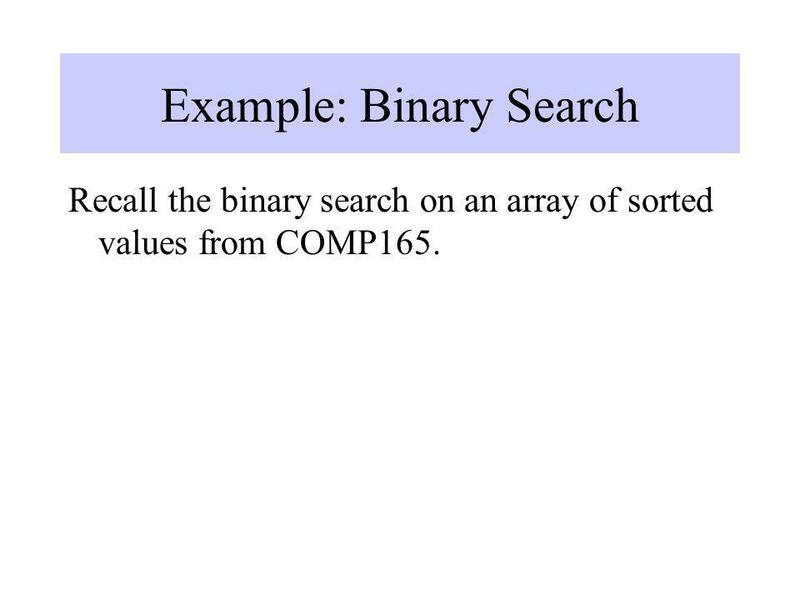 Recall the binary search on an array of sorted values from COMP165. 1. Identify the factor(s) that governs the size of the problem. 2. 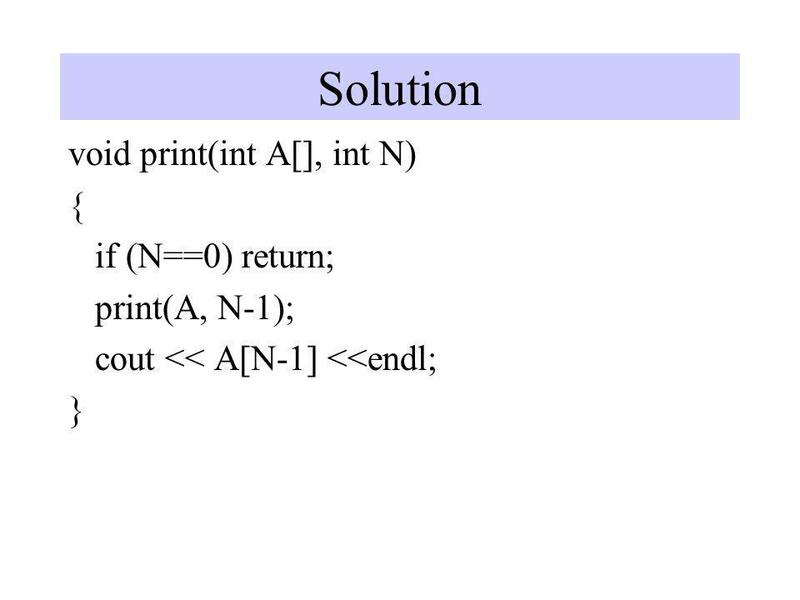 Identify the solution(s) for the smallest version(s) of the problem. This defines the base case. 3. Identify a general solution by defining the problem in terms of a smaller version of the problem. 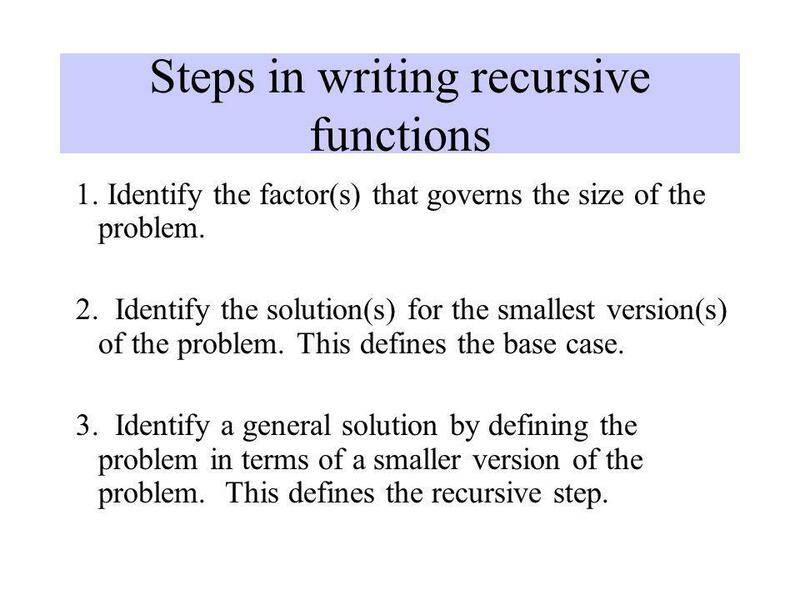 This defines the recursive step. Copyright © 2002 Pearson Education, Inc. Slide 1. Chapter 13 Recursion. Copyright © 2006 Pearson Addison-Wesley. 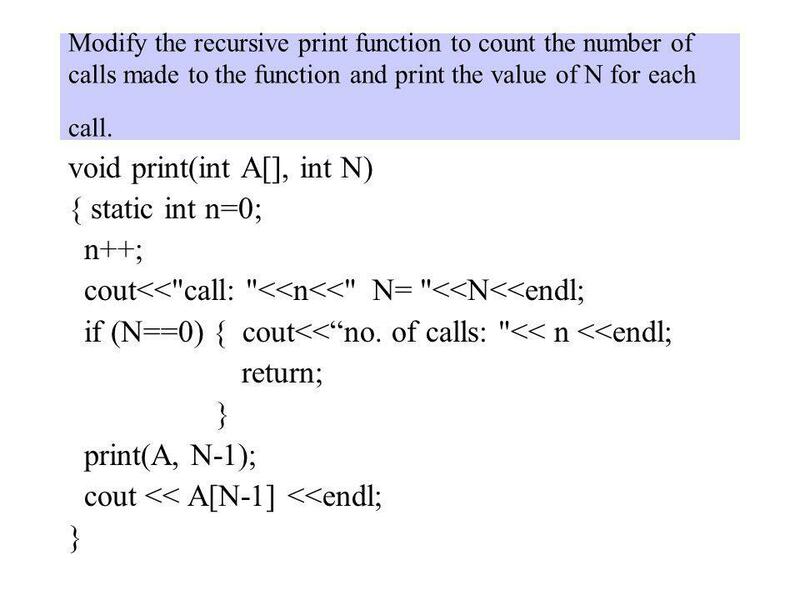 All rights reserved Learning Objectives Recursive void Functions Tracing recursive. Towers of Hanoi Move n (4) disks from pole A to pole C such that a disk is never put on a smaller disk A BC ABC. Recursion Chapter 14. 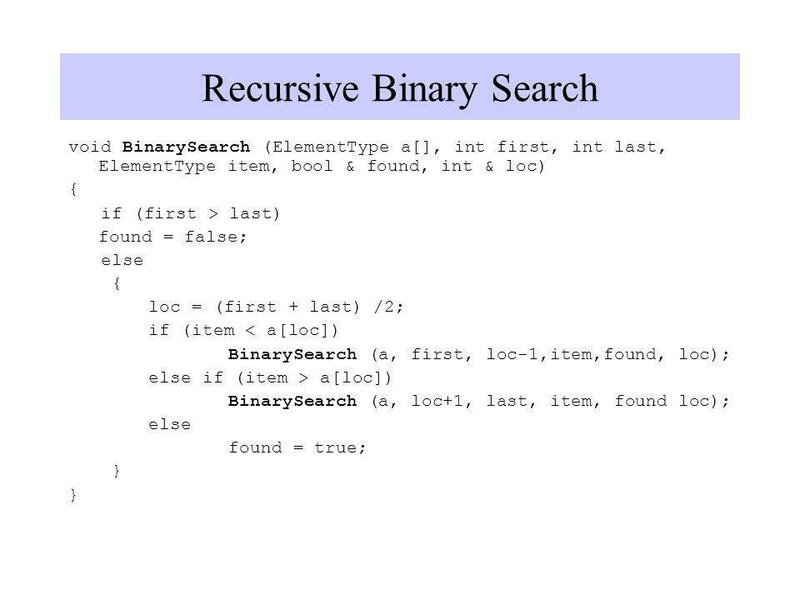 Overview Base case and general case of recursion. 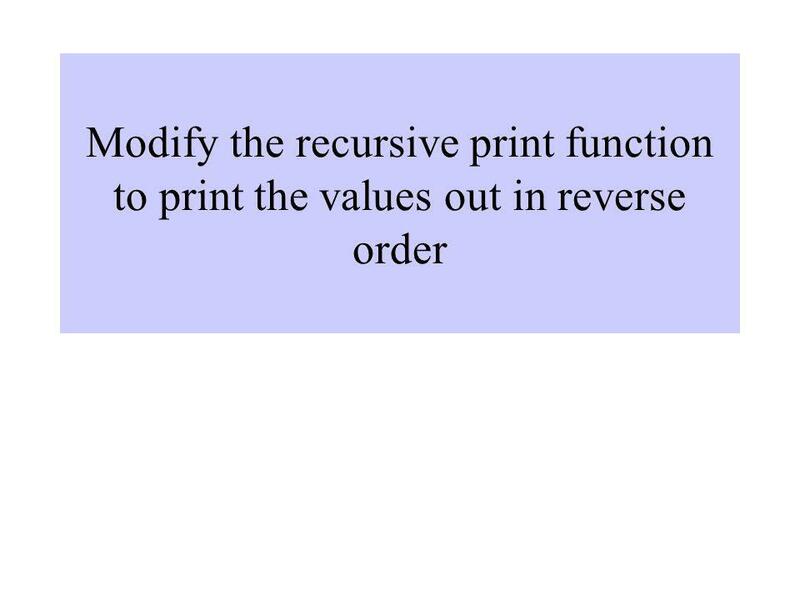 A recursion is a method that calls itself. That simplifies the problem. The simpler. Alan YorinksLecture 7 1  Tonight we will look at::  List ADT  Unsorted List  Sequential Search  Selection Sort  Sorted List  Binary Search. 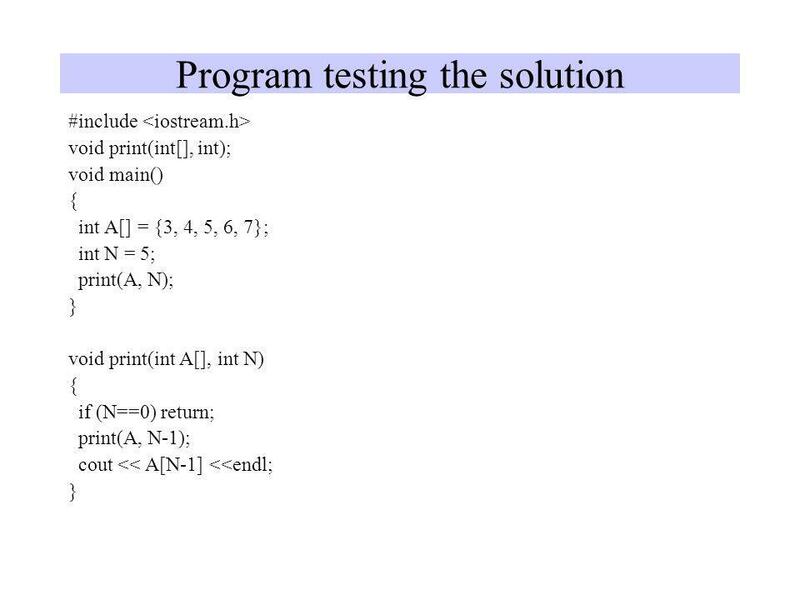 Lecture Objectives  Learn how to think recursively  Trace a recursive method  Prove a recursive method is correct  Write recursive algorithms and methods. Homework – Chapter 1 作業解答. 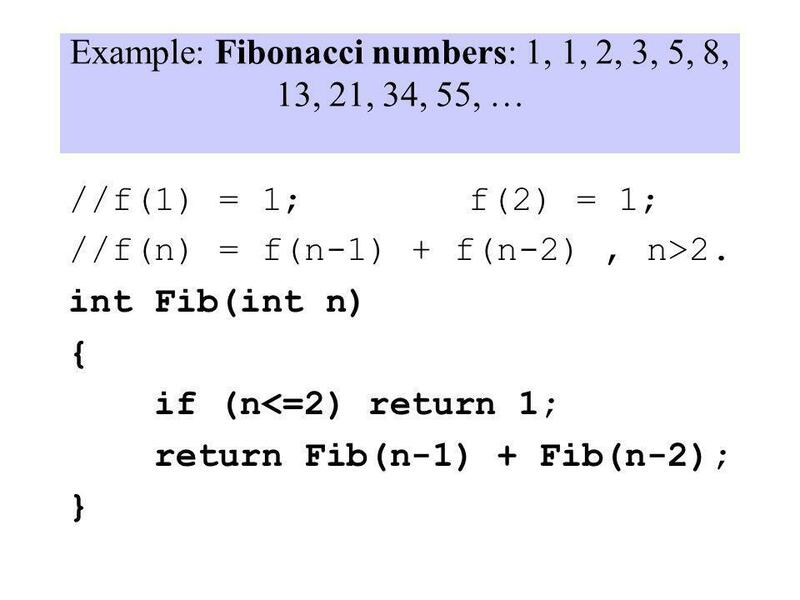 Problem 1 Given the Fibonacci number as … where the next Fibonacci number will be the sum of its previous. Functions Prototypes, parameter passing, return values, activation frams. @ Zhigang Zhu, CSC212 Data Structure - Section FG Lecture 19 Searching Instructor: Zhigang Zhu Department of Computer Science City College. 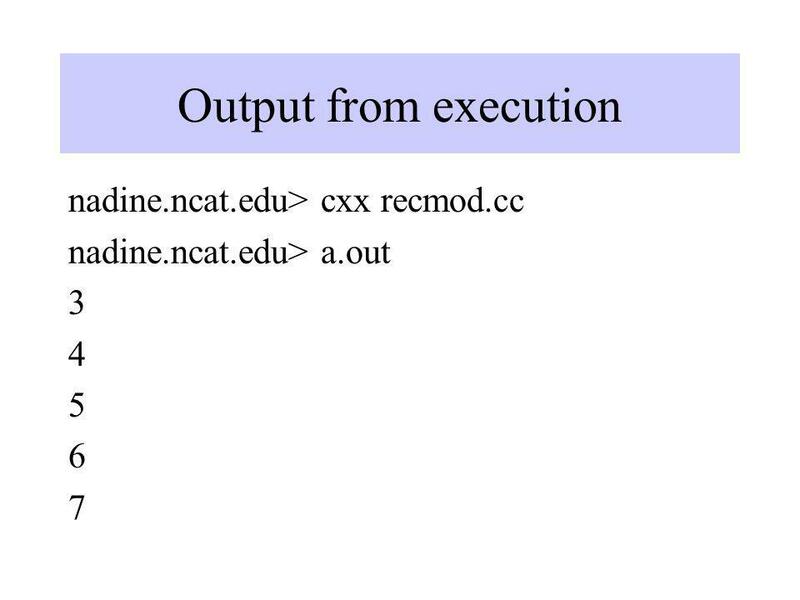 1 CSCD 300 Data Structures Recursion. 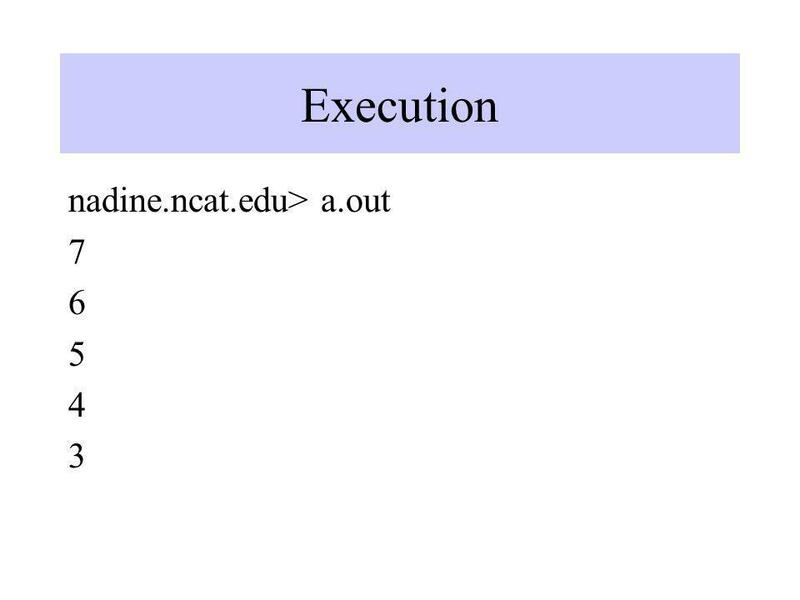 2 Proof by Induction Introduction only - topic will be covered in detail in CS 320 Prove: N   i = N ( N + 1. Monday, 12/9/02, Slide #1 CS 106 Intro to CS 1 Monday, 12/9/02  QUESTIONS??  On HW #5 (Due 5 pm today)  Today:  Recursive functions  Reading: Chapter. Recursion CS-240/CS341. 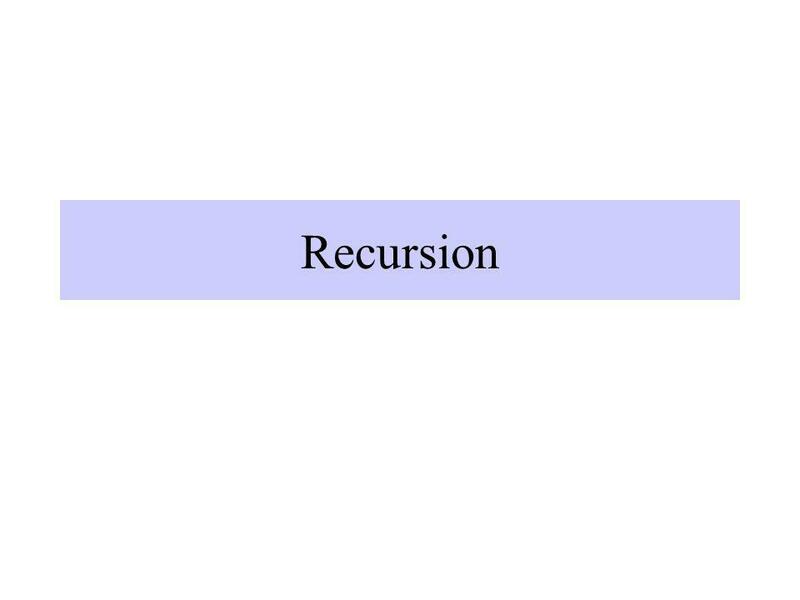 What is recursion? 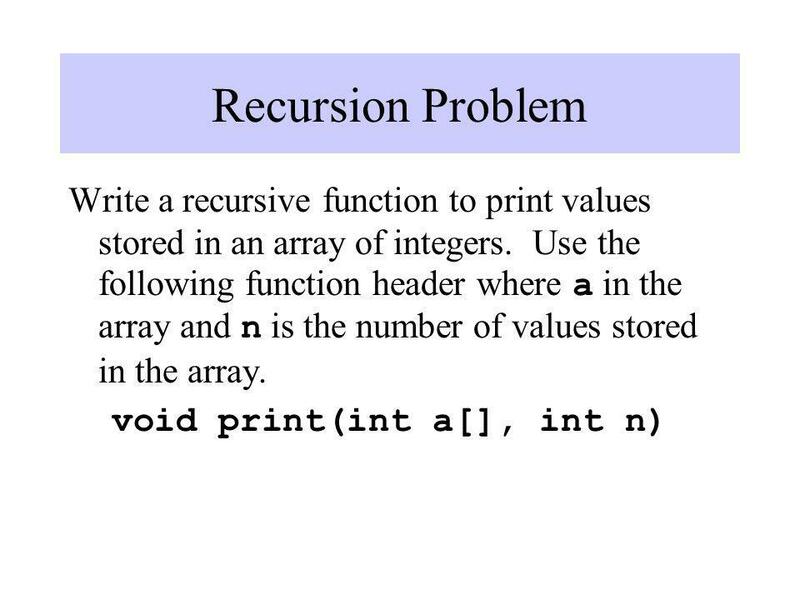 a function calls itself –direct recursion a function calls its invoker –indirect recursion f f1 f2. 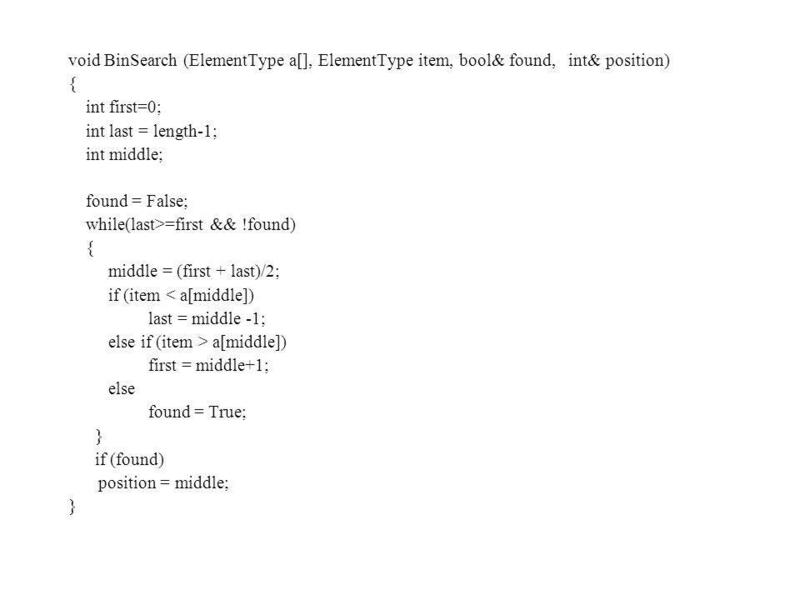 1 Section 3.5 Recursive Algorithms. 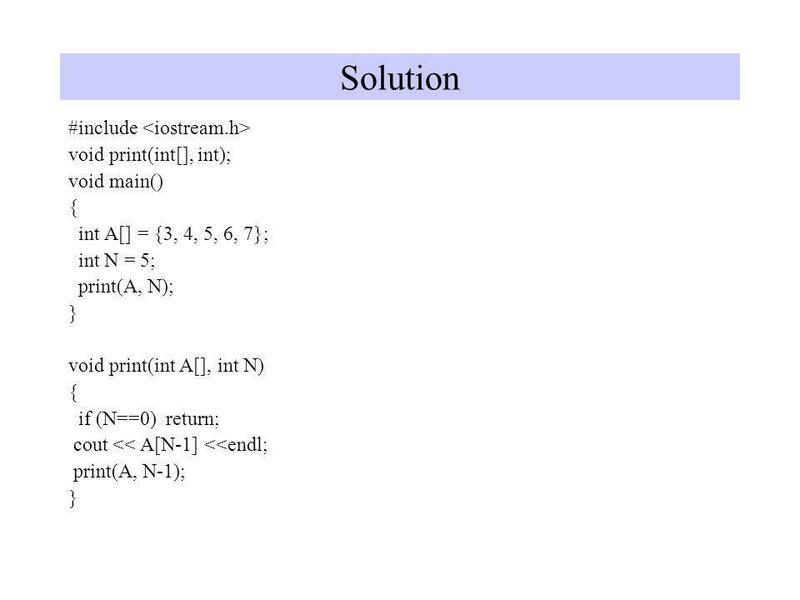 2 Sometimes we can reduce solution of problem to solution of same problem with set of smaller input values When such. 1 Sorting Algorithms (Basic) Search Algorithms BinaryInterpolation Big-O Notation Complexity Sorting, Searching, Recursion Intro to Algorithms Selection.